I just read your comment on Think Simple Now - on the story that Kent wrote. I was equally moved by the story just like everyone else who read it. Thank you for mentioning you're an ESL teacher. I just came down to the site and thanks for the amazing resources you're sharing - I'm sure they'll be of great help to a lot of ESL students. In return to the free stuff you're giving away, I want to share some information with you - I work for Zoho Challenge, a quiz maker application for teachers. 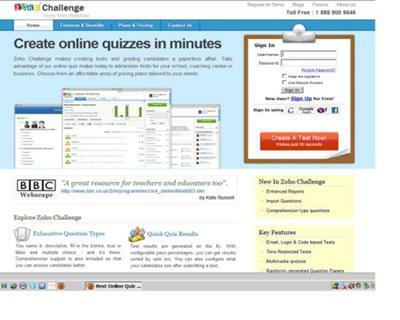 By signing up at http://challenge.zoho.com/, you can create a free account and start creating quizzes on English for your students. You can then embed these quizzes on helping-you-learn-english.com and your students can take them without leaving your site! I'm sure this will be of great use to your students - you can use it for practice tests and the like. Please check the application out at http://challenge.zoho.com/ and I'll be happy to assist you if you have any questions.